Breakfast is the most important meal of the day…or so we have been told from the time we were young. You may remember being a child and your parents giving you eggs, cereal, or even pop tarts as they were reiterating, “You have to eat before school – breakfast is the most important meal of the day!” The thing is, this concept is not wrong. Sadly though, as we get older and busier, the quality of those breakfasts begins to shift, and, in some cases, becomes non-existent. Yes, some people still stick to the concept of breakfast being important, and they fuel their body with great foods, but others revert to the fast, easy breakfast of coffee and a muffin or banana. Remember that food is supposed to be used as fuel for the body. What you eat first thing the morning is a huge component of how your body handles energy as you start your day. If you feed it processed carbs and sugar (i.e. muffins or toast), you are starting your day off with sugar. The body uses sugar as a quick source of energy, followed by a quick crash in energy. Hence, the mid-morning “tireds.” Ideally, you should be starting your day off with protein and a good fat. Your body uses both for longer lasting, sustaining energy. One of the easiest, prep-able meals! Mix up a bunch of eggs with a splash or two of coconut or almond milk and some seasonings, and voila! You have the base mix to make muffins, casseroles, or crust-less quiches. Just add whatever type of veggie or fruit you like. You can even add some chicken sausage or turkey bacon to the mix if you like the meaty flavor in the morning. Cook and store in your fridge or freezer, and in the morning, you have a well-rounded breakfast meal. Cooked eggs store 3-4 days in your fridge and 2-3 months in your freezer, so don’t be afraid to make these in big batches to slice, freeze, and grab as you need. Easy and satisfying, smoothies are a great idea for those who aren’t big on breakfast but need something to sustain them until lunch. You can make smoothies the night before and store them in your fridge to easily grab, shake, and go in the morning. I personally like to keep mine in ball jars; I find they store nicely and seal in the freshness. Some of the components to make sure you are adding to your smoothie would be greens (kale, spinach, beet greens, Swiss chard, etc. ), a good fat (coconut oil, avocado, etc.) and a protein (talk to your clinician about good and safe protein options). You can also add fruit for natural sweetness if you like. The one note I want to make about smoothies is that you shouldn’t aim to drink these daily, unless you are on a purification program or per your clinician’s request. Though they are chock-full of nutrition, you want to mix in some breakfast meals that involve the act of chewing, as your body needs to chew for healthy digestion. Back in July, our wonderful clinician Alicia shared with you her family’s busy morning staple, Soaked Baked Oatmeal. This recipe is absolutely delicious and a great morning treat. For our bread lovers… If you love having toast in the morning and aren’t ready to give that treat up yet, then sprouted grain bread is the way to go. Also, try mixing your nut butters with a little bit of coconut oil and cinnamon. These are delicious additions that help control blood sugar while adding a protein. Be wary of making this dish an everyday breakfast. Though sprouted grains are a better choice when it comes to bread, they are still not an everyday choice you would want to be making. 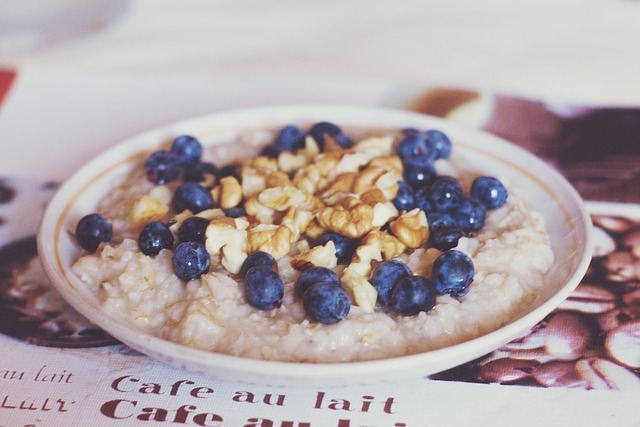 This dish is super easy and satisfying, especially for the oatmeal lovers. I like to cook up a batch or two of quinoa at the beginning of the week, or I will make extra when preparing for a meal. In the morning, you can just dish out a cup or two and place in a saucepan with some coconut or almond milk. Heat and add toppings of your choosing: soaked nuts, cinnamon, honey, maple syrup, or nut butters. These are a great option for days where you have a few minutes to fry up an egg, whether for yourself or the family. All you need are some fried eggs, Ezekiel muffin/bread, and, if you like, some pre-cooked turkey bacon or chicken sausage (you can throw these in your frying pan to heat up for a few minutes while your egg is cooking). Add condiments/toppings of your liking, such as butter or safflower mayonnaise. A personal favorite in my family is the Sunrise Surprise Breakfast Bake from the Well of Life Cooking for the Holidays cookbook. This is a great prep-ahead option, especially for the upcoming holiday mornings. Hope you get to enjoy some of these yummy ideas! Kate McNerney is an Associate Clinician at the Well of Life Center for Natural Health. The Well of Life Center is a holistic wellness center that specializes in nutrition, chiropractic, massage services, and more. Celebrating their 10th year in business, the Well of Life Center has locations in Doylestown, Bethlehem, and Ottsville, PA. For more information, please visit welloflifecenter.com. What kind of almond or coconut milk do you recommend? I think I looked at them in the past, but the ingredient list always turned me away. So many gums and other ingredients! Thanks for any reply! Great question! Honestly, the best way to ensure your almond and coconut milk is safe and healthy is to make your own. However, if time is a factor for you, there are several brands out there that you can consume. Califia Farms has a line of almond milk that is okay. Native Forest and Thai Kitchen have good coconut milks. I personally prefer the coconut milk from the can verses the coconut milk from the carton, as there are less additives. There is Guar Gum in the canned product, but Guar Gum is actually made from an actual food. You still don’t want to consume high quantities, yet on occasion it is okay and safe to have.